If you’re here in Hawaii Wednesday, you may be lucky enough to witness a historical event that’s happened only eight other times in 30 years: The Quiksilver in Memory of Eddie Aikau. The event has been put on green alert for this Wednesday, February 10 because the conditions may finally be just right. The event requires waves more than 20 feet (40-foot faces) to run. The last time it ran, in 2009, the contest had a record crowd of more than 30,000 on the beach, cliffs and road around Waimea Bay. That year the Eddie also scored the most international media coverage of any surfing event in history. Big Wave World Tour surfer Greg Long won the event. We figured the event made this a good time to write about Haleiwa and Oahu’s North Shore and why it’s the surfing capital of the world. What makes this part of Oahu so special? And, why do surfers from all over the world come here to experience big wave surfing? Among the many reasons the North Shore of Oahu is so special is Haleiwa. The historic town is the economic hub of the North Shore, but can still be considered a “small town” for sure. Since 1984, all new buildings must adhere to a design plan that reflects the Territorial architecture of Haleiwa’s earlier sugar industry period. 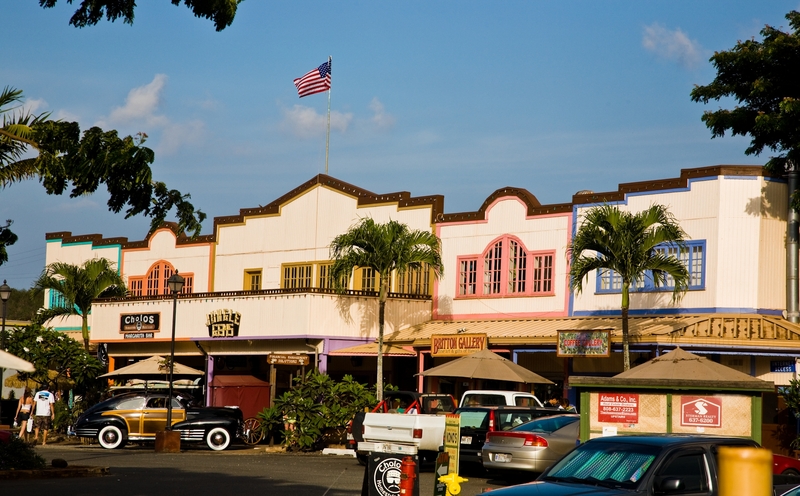 In fact, according to the Haleiwa Chamber of Commerce, the town is home to 34 historic buildings featuring plantation architectural styles influenced by the Waialua Sugar Company. By regulating the way Haleiwa “looks”, officials have also preserved how Haleiwa “feels.” Whether you stroll in-and-out of Mom and Pop shops or stop at Matsumoto Shave Ice for a quick treat, you’ll notice the town still maintains it’s plantation-era feel. You’ll find that many stores cater to the surfing community, but you can also find local, boutique art galleries, restaurants, and small retail shops that help keep Haleiwa’s charm intact. No Wal-Marts here! Haleiwa used to be a plantation village, but now it's a quaint shopping district which features boutique shops, restaurants, and surf digs. Waimea Bay: According to the Hawaii Tourism Authority, Waimea Bay was an influential surf spot during the dawn of big wave surfing in the 1950’s. That’s when Adventurous surfers began to challenge the powerful winter waves of Waimea (as well as Makaha Beach on the west side) giving birth to the big wave-riding phenomenon. Waimea Bay is one of the surf spots that host world-renowned surf competitions. In fact, Waimea Bay is home to the Quiksilver in Memory of Eddie Aikau surf competition. Ehukai Beach (Bonzai Pipeline): The Hawaii Tourism Authority says this beach is one of the most dangerous surf spots in the world, so it’s for professionals or VERY competant amateurs only. Ehukai Beach is one of the venues for the Vans Triple Crown of Surfing, even though the waves here. waves at Banzai Pipeline break over a sharp reef, no more than a few feet from the surface. Sunset Beach: Spanning in distance from Ehukai Beach (Banzai Pipeline) to Sunset Point and encompassing a dozen different reef breaks, this two-mile length of sand is considered the longest stretch of rideable surf spots in the world, according to the Hawaii Tourism Authority. Naturally, yhis is also a venue for the Vans Triple Crown of Surfing (November – December). Waimea Bay is one of the venues for the Vans Triple Crown of Surfing and is also the venue for the Quicksilver in Memory of Eddie Aikau. Whether you go to the North Shore to see history in the making at the Quicksilver in Memory of Eddie Aikau or put it on your to-do list when you arrive, Haleiwa and Oahu’s North Shore are extraordinary destinations and worth the trip from Honolulu. Hawaii Aloha Travel thinks so, too. That’s why we offer the Circle Island Tour, Polynesian Cultural Center excursion, and North Shore Shark Adventures, which cater to those who want to experience the North Shore of Oahu. We’ll take care of all the arrangements — all you have to do is sit back and enjoy! Haleiwa and the North Shore of Oahu is a must-see destination when you visit Hawaii. Once you’re there, you’ll immediately feel like you’ve stepped back in time to the surfing culture of long-ago. So, make sure you take the time to trek up to the Haleiwa and the North Shore — it’s not every day you get to see monster waves up close, and live to tell about it!